Blue Ginger brings urban dining and sophistication to the Boston suburbs. Chef Ming Tsai and his team artfully blend the unique flavors of the East with those of the West, creating food that excites the palate and entices the eyes. 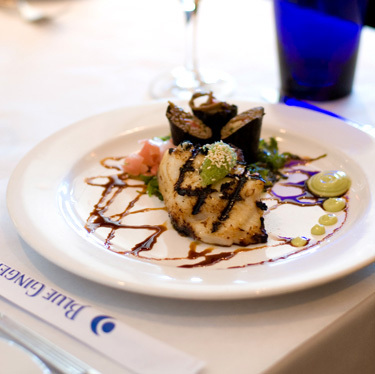 In 2008 Blue Ginger renovated and expanded, creating a chic, feng shui-inspired space with three distinct dining options. Enhancements include an updated main dining room and open kitchen, three private dining rooms decorated in the style of modern Chinese banquet rooms, and The Lounge at Blue Ginger, a casual, no reservations space serving an Asian Tapas menu featuring dishes like Ming's Bings, Ming's East-West takes on the burger. Ming's commitment to serving people safely has made Blue Ginger a destination for food-allergic diners. Zagat has rated Blue Ginger the Second Most Popular Restaurant in Boston since 2002. In 2009 Ming and Blue Ginger won the IFMA's Silver Plate Award in the Independent Restaurant category, recognizing overall excellence in the industry. In addition to being the recipient of the 2002 James Beard Best Chef Northeast award, Ming Tsai is the host of the Emmy-nominated public television show, Simply Ming, and the author of three cookbooks: Blue Ginger: East Meets West Cooking with Ming Tsai, Simply Ming and Ming's Master Recipes.